John Ronald Reuel Tolkien was born on January 3, 1892, the son of English-born parents in Bloemfontein, in the Orange Free State of South Africa, where his father worked as a bank manager. To escape the heat and dust of southern Africa and to better guard the delicate health of Ronald (as he was called), Tolkien’s mother moved back to a small English village with him and his younger brother when they were very young boys. Tolkien would later use this village as a model for one of the locales in his novels. Within a year of this move their father, Arthur Tolkien, died in Bloemfontein, and a few years later the boys’ mother died as well. The Tolkien boys lodged at several homes from 1905 until 1911, when Ronald entered Exeter College, Oxford. 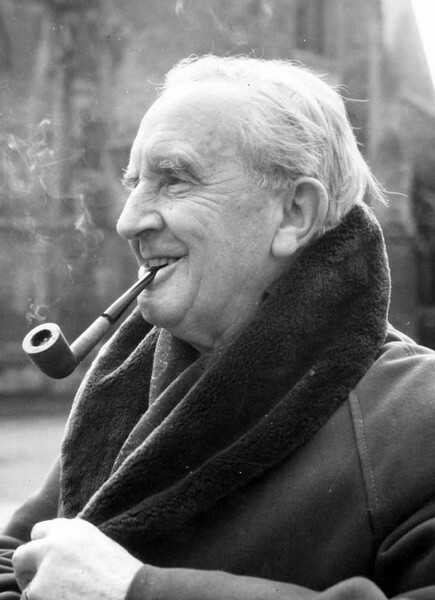 Tolkien received a bachelor’s degree from Oxford in 1915 and a master’s degree in 1919. During this time he married his longtime sweetheart, Edith Bratt, and served for a short time on the Western Front with the Lancashire Fusiliers (a regiment in the British army that used an older-style musket) during World War I (1914–18), when Germany led forces against much of Europe and America). In 1917, Tolkien was in England recovering from “trench fever,” a widespread disease transmitted through fleas and other bugs in battlefield trenches. While bedridden Tolkien began writing “The Book of Lost Tales,” which eventually became The Silmarillion (1977) and laid the groundwork for his stories about Middle Earth, the fictional world where Tolkien’s work takes place. After the war Tolkien returned to Oxford, where he joined the staff of the Oxford English Dictionary and began work as a freelance tutor. In 1920 he was appointed Reader in English Language at Leeds University. The following year, having returned to Oxford as Rawlinson and Bosworth Professor of Anglo-Saxon, Tolkien became friends with the novelist C. S. Lewis (1898–1963). They shared an intense enthusiasm for the myths, sagas, and languages of northern Europe, and to better enhance those interests, both attended meetings of the “Coalbiters,” an Oxford club, founded by Tolkien, at which Icelandic sagas were read aloud. 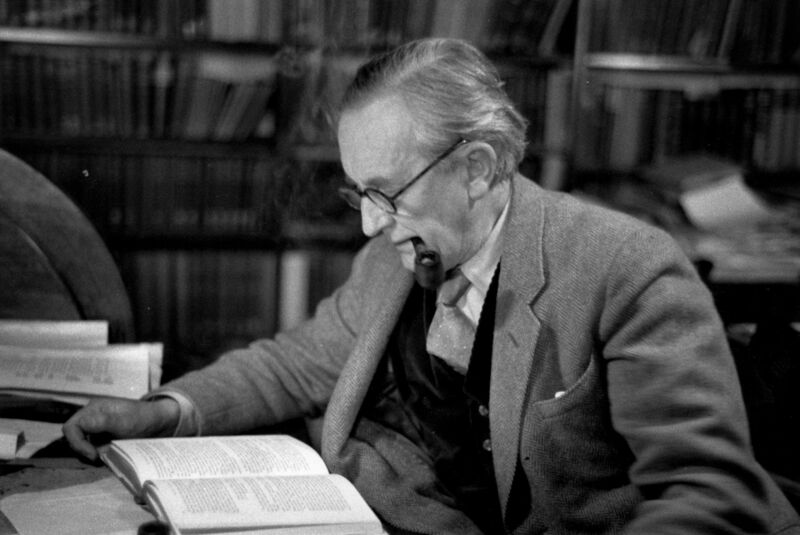 During the rest of Tolkien’s years at Oxford—twenty as Rawlinson and Bosworth Professor of Anglo-Saxon, fourteen as Merton Professor of English Language and Literature—Tolkien published several well-received short studies and translations. Notable among these are his essays “Beowulf: The Monsters and the Critics” (1936), “Chaucer as a Philologist [a person who studies language as it relates to culture]: The Reeve’s Tale” (1934), and “On Fairy-Stories”(1947); his scholarly edition of Ancrene Wisse (1962); and his translations of three medieval poems: “Sir Gawain and the Green Knight,” “Pearl,” and “Sir Orfeo” (1975). As a writer of imaginative literature, though, Tolkien is best known for The Hobbit and The Lord of the Rings, tales which were formed during his years attending meetings of the “Inklings,” an informal gathering of like-minded friends and writers, that began after the Coalbiters dissolved. The Inklings, which was formed during the late 1930s and lasted until the late 1940s, was a weekly meeting held in Lewis’s sitting room at Magdalen College, at which works-in-progress were read aloud and discussed and critiqued by the attendees. Inklings, Lewis urged Tolkien to publish The Hobbit, which appeared in 1937. Tolkien retired from his professorship in 1959. While the unauthorized publication of an American edition of The Lord of the Rings in 1965 angered him, it also made him a widely admired cult figure in the United States, especially among high school and college students. Uncomfortable with this status, he and his wife lived quietly in Bournemouth for several years, until Edith’s death in 1971. 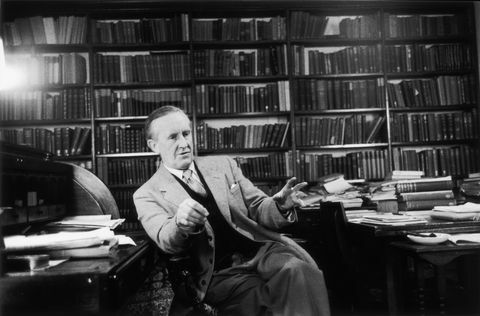 In the remaining two years of his life, Tolkien returned to Oxford, where he was made an honorary fellow of Merton College and awarded a doctorate of letters. He was at the height of his fame as a scholarly and imaginative writer when he died in 1973, though critical study of his fiction continues and has increased in the years since. Tolkien, a devoted Roman Catholic throughout his life, began creating his own languages and mythologies at an early age and later wrote Christian-inspired stories and poems to provide them with a narrative framework. Based on bedtime stories Tolkien had created for his children, The Hobbit concerns the efforts of a hobbit, Bilbo Baggins, to recover a treasure stolen by a dragon. During the course of his mission, Baggins discovers a magical ring which, among other powers, can render its bearer invisible. The ability to disappear helps Bilbo fulfill his quest; however, the ring’s less obvious powers prompt the evil Sauron, Dark Lord of Mordor, to seek it. The hobbits’ attempt to destroy the ring, thereby denying Sauron unlimited power, is the focal point of the Lord of the Rings trilogy, which consists of the novels The Fellowship of the Ring (1954), The Two Towers (1954), and The Return of the King (1955). In these books Tolkien rejects such traditional heroic qualities as strength and size, stressing instead the capacity of even the humblest creatures to win against evil. 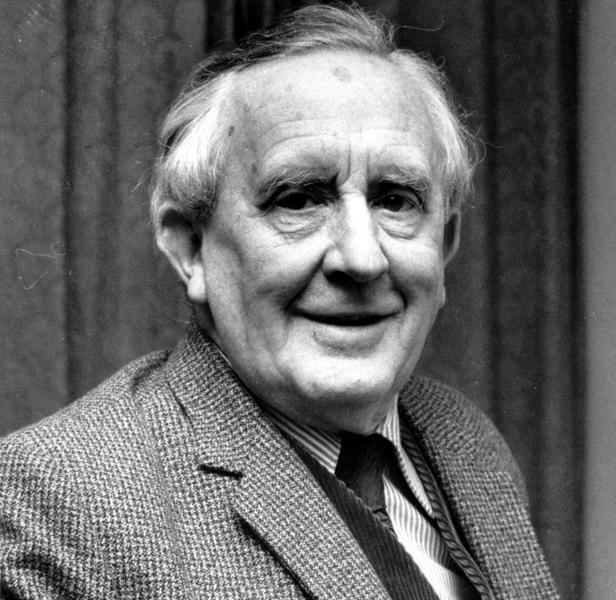 Throughout Tolkien’s career he composed histories, genealogies (family histories), maps, glossaries, poems, and songs to supplement his vision of Middle Earth. Among the many works published during his lifetime were a volume of poems, The Adventures of Tom Bombadil and Other Verses from the Red Book (1962), and a fantasy novel, Smith of Wootton Major (1967). 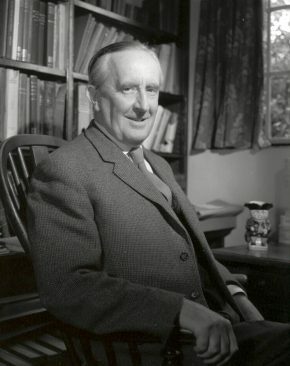 Though many of his stories about Middle Earth remained incomplete at the time of Tolkien’s death, his son, Christopher, rescued the manuscripts from his father’s collections, edited them, and published them. One of these works, The Silmarillion, takes place before the time of The Hobbit and tells the tale of the first age of Holy Ones (earliest spirits) and their offspring. 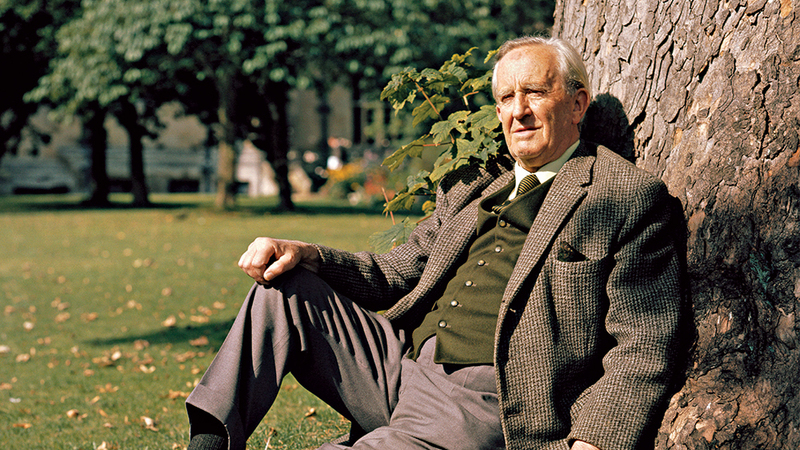 Nearly thirty years after his death, the popularity of Tolkien’s work has hardly slowed. In 2001 The Lord of the Rings: The Fellowship of the Ring was released as a major motion picture. The magic of Tolkien’s world won over both the critics and public alike as the movie was nominated in thirteen categories, including Best Picture, at the Academy Awards; it won four awards. Two more films are scheduled for release by the end of 2003.